Matt took his behind-the-wheel driving test today at the DMV in Poway. He drove me there in Susan's Mazda. We put his name on a list with a few other new 16-year-olds, and waited. I entered a few grades onto my computer. Matt was called outside almost immediately. I didn't witness the test, but the scoresheet shows that the evaluator noticed only three errors. 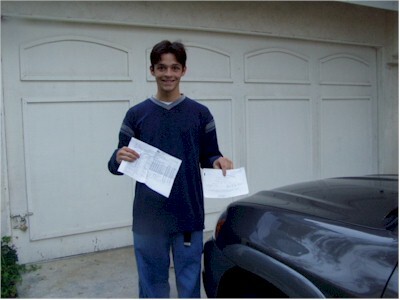 In California, one can pass the driver's test by making fewer than 15 errors, so Matt passed easily. In two of the cases, he was going TOO SLOW: 25-30 mph in a 35 mph zone. I told him he'd be indistinguishable in San Diego from all the retired folks visiting from Arizona.